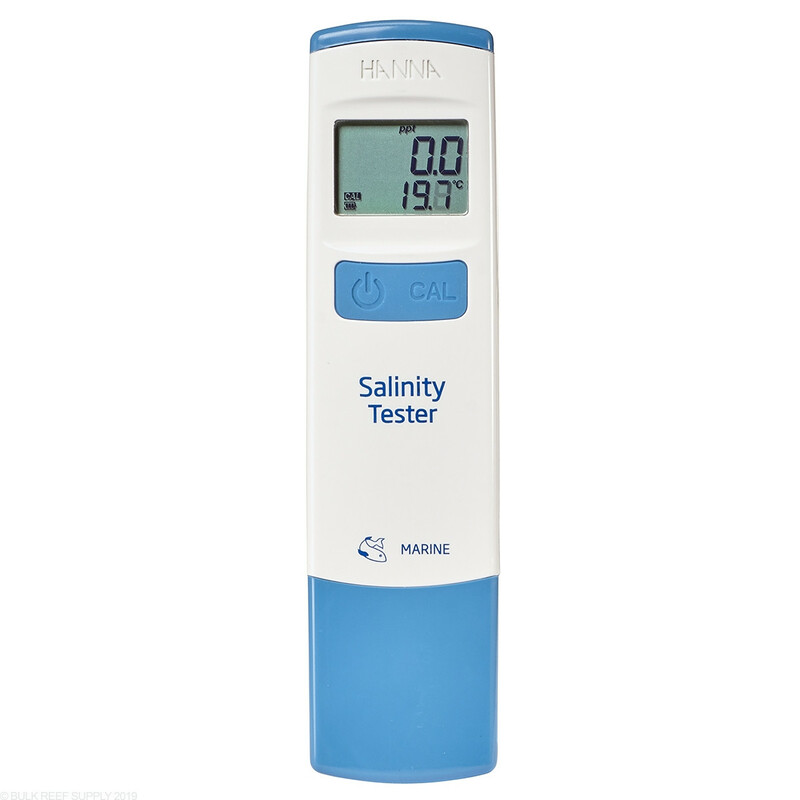 Hanna Instruments HI98319 Marine Salinity Tester measures electrical conductivity (EC) to determine the salinity of natural and artificial seawater. 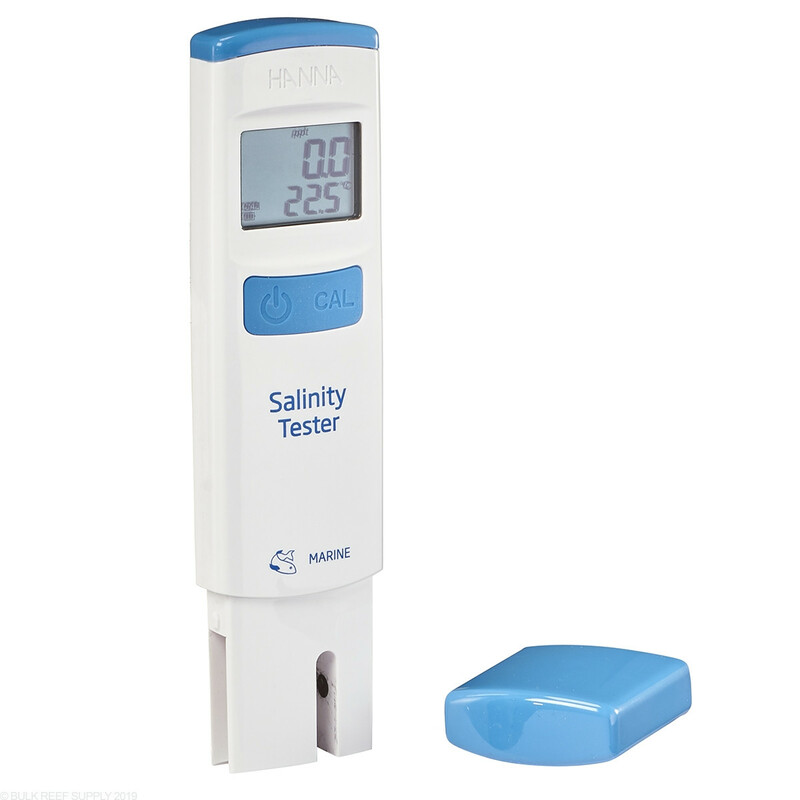 Within seconds, the salinity and temperature are measured, and then using the temperature reading, automatically compensated and displayed on the easy to read LCD screen. Ensuring the proper salinity in your reef tank allows your fish and corals more time to grow instead of having to adjust to constant salinity changes. 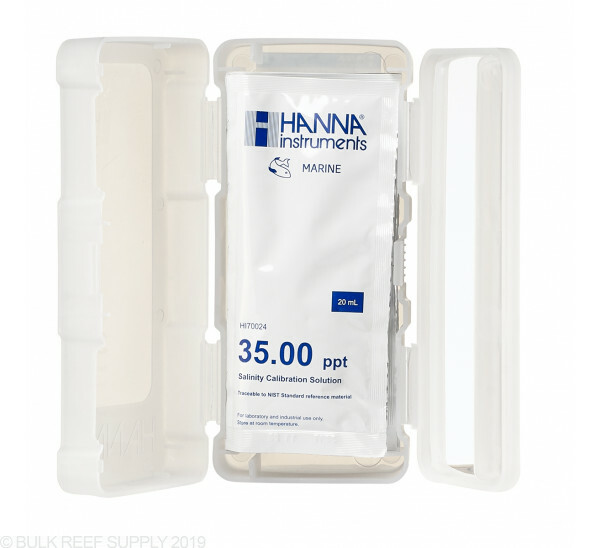 If you have a hard time seeing the fuzzy blue line common with traditional refractometers, or just want to make your life easier, pick up a Hanna HI98319 Salinity Testing Pen! Perhaps just a bad unit, but accuracy was just never there for me and I was always careful to rinse and clean after every test and calibrate it regularly following every step as carefully as possible. Using my refractometer is just easier and more reliable. I'm past any return window, so I'll have it as an emergency backup I suppose, but I should have either stuck with the refractometer only or paid more for the Milwaukee. I just got mine today so I thought I better give it a test run. After setting it up per the instructions that were easy and painless off I went to test my new mixed batch of water. Way fast and even easier to read. I love this because my eyes are not what they use to be so trying to read my refractometer has been getting harder and harder. Would I recommend this? Yes I would. I am unable to calibrate with the solution, the reading is always low compared to a freshly calibrated refractometer with a new bottle of brs refracto drops . i called a few times asking what i was doing wrong, what could be the issue, am i missing something. I calibrated it off one of my tanks at 35ppt, then it read the other tank as expected and matched my refractometer. The solution calibrated several points lower. it was suggested i send it back for a refund. I sent it back as recommended, and was told it was just fine, and told i could pay a restocking fee. a few questions and the response i got, is that this is NOT for testing tank water, only fresh water. what ??? so to test my 2 tanks i need a seperate checker ?? i don't buy it. BRS .......Thanks for reaching out to us. Our testing results from yesterday stated the HI98319 Marine Salinity Tester was not defective and we were able to calibrate to the standard and test tank water accurately. For our next steps we can either send it back, if not issue you a refund minus 10% for the restocking fee. If you have any further questions please let us know. Hope to hear from you soon! Me........Hmm, strange. Reading ppt?? Or something else? At what temp was the calibration fluid?? I called a few times trying to resolve why the temp and the calibration read low. And why I was unable to calibrate it and re read the calibration fluid at 35 again. I purchased some of your 35pt refractometer solution to verify my refractometer was at 35, then tested the tank at 35. I would calibrate the new meter, then test the tank it read 32, if I were to calibrate it in the 35ppt tank, then it read the second tank as expected in comparison to the refractometer. If I calibrated it in the included packets it read both tanks low. When I called I was told to send them back, no problem. BRS.......The product is really only intended for testing fresh mixed saltwater and not for testing tank water due to contaminates can interfere with the reading. Along with that if you don't let it settle you can get inaccurate results and ambient room temperature is recommended for the fluid. If you have any further questions please let us know. This tester is awesome! With almost instant and very accurate salinity readings, compared to my Red Sea refractometer, and the temp probe is accurate to within a half degree to calibrate your Apex or other controllers temp sensors to also. No more dripping saltwater on the flooring or trying to read a refractometer with my less than perfect eyesight! Calibration was quick and easy after selecting the type of output reading you desire and your good to go. Well done Hanna! Super easy instant read. Cant imagine using anything else. IT is so simple and accurate. Amazing product. Easy to use and accurate. Even floats. I love this thing. Super easy to use and instant readings. I have double checked it against a freshly calibrated refractometer and it is spot on Everytime. I think I will be spot checking it bi weekly from here out. This meter is super accurate and really easy to use, best purchase I have made for my reef tank. Calibration was really easy and Hanna gives you plenty solutions with the meter. 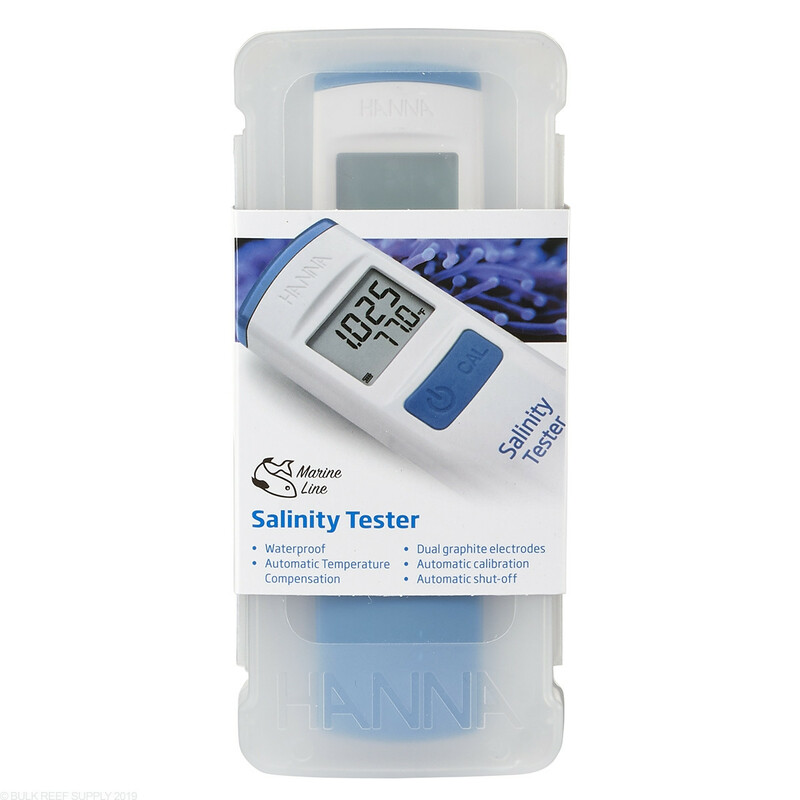 Perfect tool for acclimating new fish as it reads both salinity and temperature. Great job Hanna! I’m very impressed, I’ve used the Milwaukee for years and after using the Hanna salinity checker I can say this is just as accurate, as long as you do everything properly and follow the guidelines. But the most impressive feature is the ease of use. Makes water changes between multiple tanks much easier.